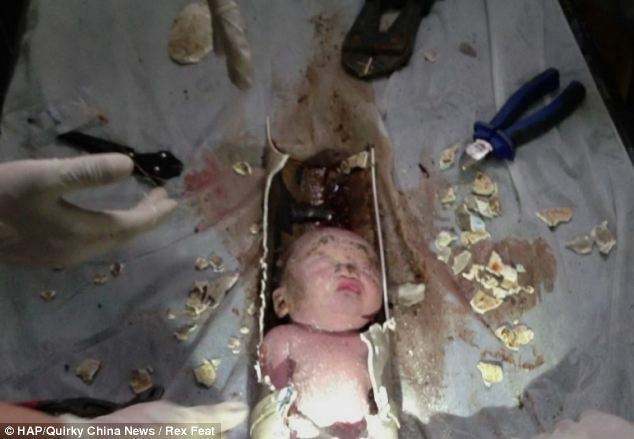 A newborn baby rescued from a sewer pipe in China has been returned to his mother who will not face charges. Firefighters were called to a residential building in Jinhua city, eastern China to rescue the baby. The infant was trapped in an L-shaped section of sewage pipe just below a squat toilet in one of the building’s public lavatories..
A video of the infant, known as Baby 59 because of his incubator number, being rescued gripped the world. The as yet unnamed woman is a high school graduate who works at a restaurant. She said she became pregnant after a one-night stand with a man who initially denied any responsibility. But the man has now requested a paternity test and is reported to be ready to discuss with the woman how to support the child. The woman told police she could not afford an abortion and secretly delivered the child Saturday afternoon in the toilet. She said she tried to catch the baby but he slipped into the sewer line and that she alerted her landlord to the trapped child after she could not pull him out, it was reported. In the video, firefighters were shown removing the pipe from a ceiling that was just below the toilet. Then in the hospital medics were seen using pliers and saws to gently pull apart the pipe, which was about 10 centimetres (about 3 inches) in diameter. The baby, who weighed 2.8 kilograms (6 pounds, 2.8 ounces), had a low heart rate and some minor abrasions on his head and limbs, but was mostly unhurt. Police have said the woman faces no charges, deciding she did not initially step forward because she was frightened but gradually had a change of heart and began to tell the truth.